February 18, 2018 at 12:09a.m. Fine Northeast Ohio-made wines and good conversation flowed freely at the Winter Wine Affair hosted by the Ohio Wine Producers Association on Saturday at Stambaugh Auditorium. Two sessions, from 1 to 4 p.m. and 6 to 9 p.m., featured dozens of wines available to taste and purchase. All guests received a free souvenir wine glass, said Jen Gerger, the Geneva-based association’s coordinator of the events. Also, the event featured entertainment by saxophonist Stan Miller and shopping at local vendors and award-winning Adams’ Reserve cheeses, Gerber said. “Some people look down their noses at Ohio wines, but Ohio-made wines are really good,” agreed Rick and Robin Krizan of Medina, and their son Drew Smock, a recent graduate of the University of Toledo, who were enjoying the afternoon show. “We attended the show at Stambaugh last year and came back for more,” said Rick, who said their favorite wines are dry reds. The Krizans, both of whom work in the insurance business, said they make at least a half-dozen trips annually to Ohio wineries, visiting several during each trip. The wine-tasting was a “girls day out” for Kim McCuskey and Aubrey Holland, both of Boardman and both sipping some wine. “There were some very good-tasting wines here and a wide variety, including some odd-tasting wines, too,” said the women. Mostly, their wine-tasting excursions are fundraisers for Friends of Fido, of which they are members, said McCuskey, owner of the Pet Lodge USA in Boardman. Holland is manager of the business. Also among the afternoon guests were Tom and Barbara Bartos of Boardman. She is retired after working 35 years at Northside Regional Medical Center, and he is an agency nurse at Northside. “Our vacations are geared toward wine and food, and at least once a month we go to wine-tastings,” said Barbara. “We love the local wines. They are really good,” she said. 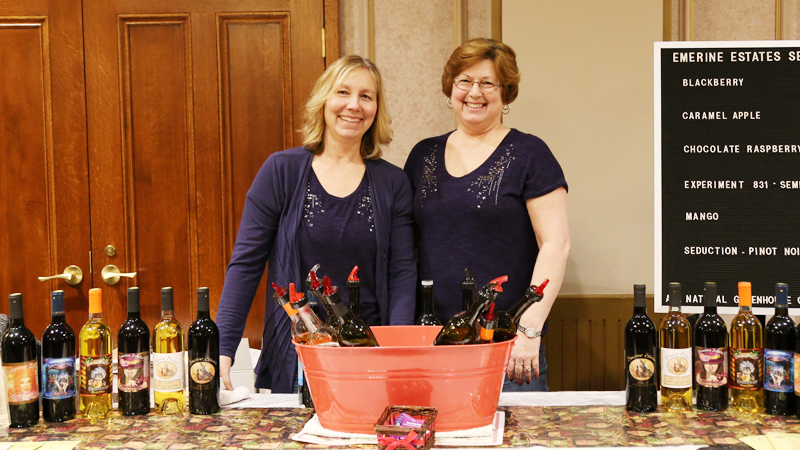 Among the local wineries with their products on display was the Greene Eagle Winery, whose theme is “Take a Sip Back in Time,” reflecting its country setting at 2576 Davis Peck Road in Greene Township in northern Trumbull County. “We make all of our wine from juice, said Denise Bliss, co-owner of the winery with Dale and Keith Bliss. “We tried growing vines, but the deer kept eating the grapes,” said Denise. Like most of the wineries, Greene Eagle Winery offers food, which Denise described as a light menu. She invited people to come out and enjoy the country setting from the deck or fireplace. Another Cortland-area winery with some country in its DNA is the Country Porch Winery, 2282 state Route 305 (Wilson-Sharpsville Road), which also had its wines on display at Saturday’s event. It offers local and regional wines and a menu with items designed to go with wine, ranging from appetizers, sandwiches and homemade pizza to steak and chicken and burger nights, according to its social media advertising. The Ohio Wine Producers Association divides its members into geographical area called wine trails, said Gerger. Youngstown and Warren area wineries are part of the Canal Country Trail, which stretches west to east from Akron to the Ohio-Pennsylvania border and about 35 miles south of Youngstown. November 4, 2011 12:05 a.m.